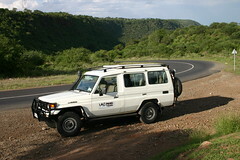 While there is much to write about our recent African Safari (we got back safely--thanks to everyone who asked! ), one particular thing that really stands out is the African Beef we ate during our weeks in Kenya and Tanzania. You see, nearly every place we stayed had a nice big buffet dinner (don't ask about the diet) that featured excellently prepared African Beef. In every case the beef was incredibly tender, lean, and very tasty. It was hands-down better than the vast majority of beef we've had in the United States. After a few days of this, I got to thinking about why the beef was so good. Here's my thinking on it. The beef we had in Africa was often very fresh. They don't transport it in from nearly as far away as we often do in the United States. And the cows aren't fed the sort of unnatural diets that they are here too. Most of them are out grazing the countryside, eating whatever grass and other greens catch their eye. In other words, they're left in their natural environment rather than being cooped up in some industrialized beef manufacturing system. The locals I talked with seemed to agree. The combination of locally raised cows eating what they're supposed to eat really makes from some excellent eating. It might be the breed of cow, too. It is probably marketing, but "Aged Beef" is supposed to have better flavor than fresh. There are a few places one can get that sort of beef in the US, but it sure as heck isn't in the big brand grocery stores, and thanks to the creative use of carbon monoxide to color the packaged meat red, it's also hard to spot honestly fresh stakes with those that are less so. I agree that it's way the heck better than the cow meat usually served up, but because it requires significantly more land per animal than "traditional" feed lots, it's also far more expensive. Still, it makes for a mighty good steak. Sounds very similar to Brazilian beef : lean, natural grazing and the animals actually get the chance to exercise. Scott, there is aged by sitting in a truck traveling and flying around and then there is "Aged Beef"
"True" aging makes beef more tender and taste better but it also reduces its shelf life and its weight, both things supermarkets don't want! You also need a very specific setup for aging.. If the beef is to cold it freezes, to warm it spoils.. Even the humidity has to be controlled.. Not something you can do at the standard grocery store. I've done a fair bit of traveling, and it's been my experience that most foods consistently taste better--more natural, less plasticky, with more intense flavour--nearly everywhere but North America. Why's that? I figure it's because elsewhere they're using less pesticides, and not trying to preserve the food for huge trips across the country. Also, they don't aspire to deliver every product imaginable, so you're generally eating fresher, more expertly-grown food. I'm reading "The Omnivore's Dilemma". It talks a lot about corn, and its agriculture in the US, and corn-fed beef. Check it out! Living in Montana, I have access to a lot locally raised beef. It's hands down better tasting then beef I have had other places. We have one regional restaurant (Sir Scott's Oasis) that was featured in those "Beef it's whats for dinner" commercials that gets all their beef locally. Many of these places sell their beef online as well. Try a search for "Montana Natural Steaks". I've read that book. It's quite good. Yeah, their local fruit was amazing too. There's set and setting too... cotton candy tastes pretty good at a carnival, but not so good at home. I grew up on a farm/ranch in the midwest, and we raised our own beef. More out of economic need than quality. The cattle grazed on prarie grass during the summer and ate a mixture of ground oats and hay over the winter. No antibiotics, or fancy feed (we couldn't afford it). Frankly, it wasn't that good. It was often tough -- it's the forced inactivity of the feed lots that keeps em tender, not roaming the pasture -- makes em tough. And often the meat had a sort of gamey flavor. It was nice to know that the unwanted chemicals and medications weren't present, but frankly compared to the beef available from the supermarket it wasn't great. Also, as others mentioned, it is usually aging that improves the flavor, as opposed to freshness. I'm not sure of the reason you found African beef better (maybe the breed), but as someone who was raised on "fresh", "natural" beef let me just add that it aint all it's cracked up to be. I have to post a word of caution. "The Omnivore's Dilemma" is a very trendy NY Times best-seller, but, by god Virginia, a lot of the "science" in the book is bad (starting with "humans are mostly carbon" on p. 44). I, personally, have the luxury of eating beef that's been raised on an "Argentinian Diet", and, in my opinion, it tastes better than grain-fed beef. Ironically, the organic farm from which it comes mostly sells their meats *frozen*, which, I'd argue introduces a lot of free radicals into the equation. I will only buy it fresh, which means I don't eat beef that often. The basic concept is that you should only eat things produced within 100 miles of where you live. When living in the developing world, I often joke that I accidentally eat such a diet. It's just far more natural to do so there. I had the same experience in Costa Rica...it just tasted (I found it hard to describe at the time, but it became clear when I got home)...it had more taste. More flavor. The stuff at home felt "muted" by comparison. It's the same kind of thing we have to resort to spices to do here. Grass-fed beef makes a huge difference. I know of 3 butcher shops in San Francisco that sell grass-fed beef. It's not cheap. At least $15-$20 per pound. I've never actually tried beef from either of those places; I just have their info. I have eaten grass-fed beef though and it's worth the additional cost. The tenderness of the beef is one thing. Marinades and rubs to give it more flavor are another. I've eaten beef from http://creekstonefarms.com/ and it was very good. I don't know all of the details, but I think the cattle are corn-fed, not grass-fed. I'm pretty sure I've had this grass-fed beef, which was also very good: http://www.estanciabeef.com . Looks like you had lots of fun on your African safari. Most people don't know that an African vacation is an experience of a lifetime. I would encourage people who havent visited africa to do so. I'm sure glad our food is still natural and that you loved it. what i dont understand is why beef is cheap in South Africa and so expensive in the U.S.? my buddy is in johannesburg right now and is buying porterhouse for about 1 dollar a pound but yet here in the sates it costs more than 16 dollars a pound? The Blu-Ray and HD DVD Stupidity. When will it end?